Boasting an A++ energy rating, the Liebherr GNP2313 Freezer, in white, is a smart way to freeze your food. With 60cm width, a reversible door and height adjustable feet it can fit in to any kitchen, whatever the layout. The interior of the GNP2313 Freezer features six drawers with transparent fronts so you can find what you are looking for at a glance. 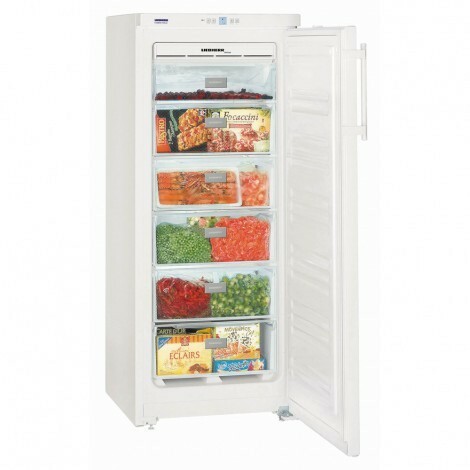 Its 188 litre net storage space is generous enough to meet the frozen food needs of any big family. The time-controlled SuperFrost function drops the temperature to -32°C in no time. This preserves the vitamins, taste and appearance of the food. The freezer then switches back automatically to the normal mode. The Liebherr GNP2313 includes the NoFrost system which provides rapid, fan-assisted, frost-free freezing and creates a much larger storage capacity, completely eliminating the need to defrost. Its VarioSpace feature gives you the flexibility of removing the drawers to accommodate larger items. With 24 hours power failure safe storage time, 16kg freezing capacity in 24 hours and optical and acoustical freezer malfunction warning signal, the Liebherr GNP2313 Freezer ensures that you’ll always have convenient and accessible storage for your frozen foods.